— A LOW flood threat has been issued for the 416 and Burro fire burn scars. The main synoptic feature across much of the American West continues to be a sprawling ridge of high pressure stretching from California to the Dakotas. Western Colorado is situated near the center of circulation at mid-levels this morning, with a small weakness in the ridge present over southeastern portions of the state. This weakness is due to a broad upper-level low currently over the Texas/New Mexico border approaching Colorado slowly from the southeast. 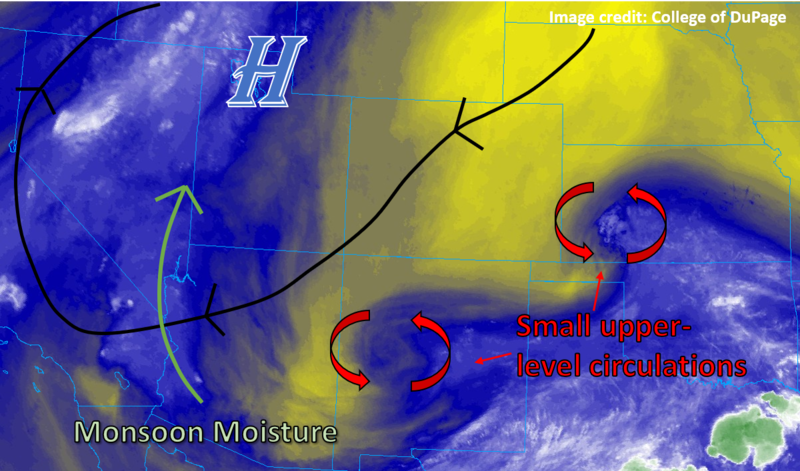 A couple of smaller-scale upper-level circulations are embedded in the northern fringes of this feature, as is apparent on this morning’s water vapor satellite imagery (annotated below). Moisture will be the main limiting factor, as precipitable water at the Grand Junction and Albuquerque, NM sounding sites is at-or-below average for mid-August. However, the approaching upper-level features, while weak, are expected to generate enough extra lift to cause some scattered convection across the southwestern mountains. 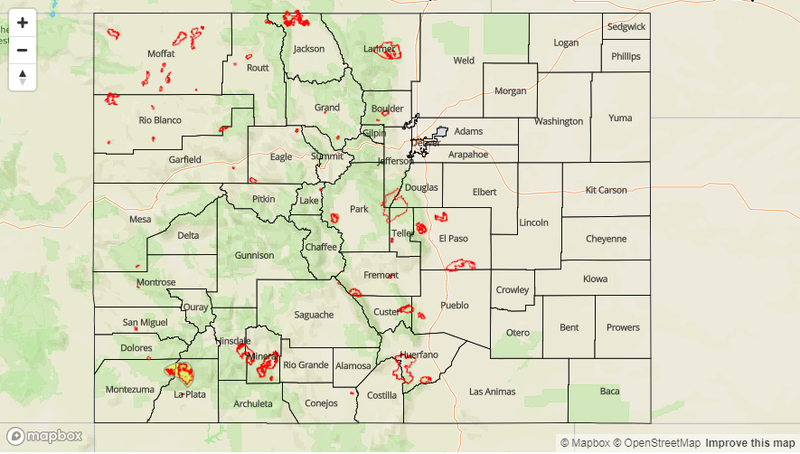 Rain coverage and intensity are both open questions today, but a low chance exists for rainfall rates of 0.50-0.75” per hour over the recent burn areas in the San Juan mountains. These storms may be relatively slow-moving from NE to SW, with storm motions around 15-25 mph. Therefore, if a couple of cells line up over the recent burn areas, mud flows and debris slides may become an issue. The weak upper-level flow and dry surface air will also mean that convection may produce well-defined outflow boundaries, offering opportunities for scattered storms to continue well into the evening hours. The flood risk therefore extends until midnight tonight. Elsewhere, storms are expected to remain fairly isolated. Dry surface air will limit storm coverage and also result in an abundance of virga showers across the southern tier of the state. Gusty outflow winds will be possible in the vicinity of convection today, with or without rain actually reaching the surface. Along the western slope, dry thunderstorms may be even more pronounced, with the risk of dry lightning strikes accompanying gusty winds. The potential for new fire initiation along the western slopes should be closely monitored today. Clear conditions to start off this morning, then clouds will gradually increase over the higher terrain into the afternoon. Storms are expected to start developing over mountainous areas by around 1-2 PM, and may linger in spots until nearly midnight tonight. Rainfall chances are best in the San Juans, where rainfall rates of 0.30-0.75” per hour are possible, and total accumulations for the day may top 1” in spots. Further northwest, appreciable rainfall is unlikely along the Northwest Slope and Grand Valley, but convection may bring gusty winds and dry lightning, posing a fire risk. Sunny to start with today with isolated storms building into the afternoon. Rainfall rates should be generally light, and most passing storms will produce just a trace to a few hundredths of an inch of rain. Dry lightning may be an issue, particularly across the southern half of this area. Seasonable summer weather for areas east of the mountains today. Along and north of the Palmer Ridge, temperatures will be generally a few degrees above seasonal normal with high temperatures in the upper 80s °F and lower 90s °F. South of the Palmer Ridge, a little more cloud cover is possible, keeping temperatures just a few degrees cooler than average. Highs will be in the mid-80s °F to around 90°F.